and I was also determined to make sure they weren't complicated! 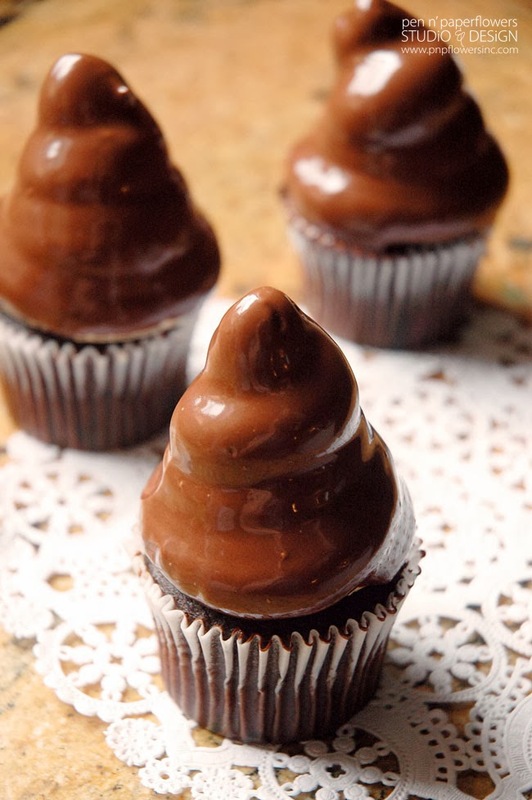 A Hi Hat Cupcake is simply a cupcake frosted with a technique that resembles a twisty ice cream cone dipped in chocolate. 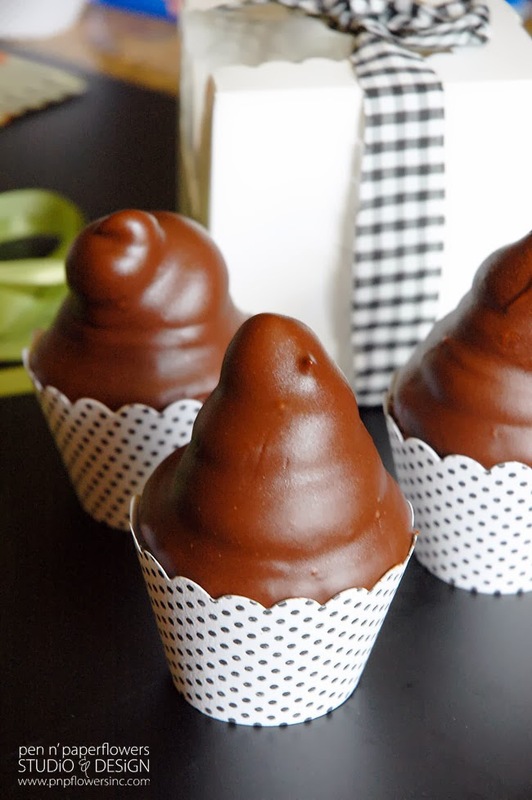 I ran out and purchased store-bought chocolate cupcakes and quickly eliminated my need for having to bake any. Afterall, the frosting technique is what makes these cupcakes a hi hat and that was my real focus and challenge. Next, I refrigerated the cupcakes in their original container for about 30 minutes so I could then cleanly pop off the blob of frosting that had already been piped on! Ha! (You can also request unfrosted cupcakes from your local bakery to eliminate having to do this step). 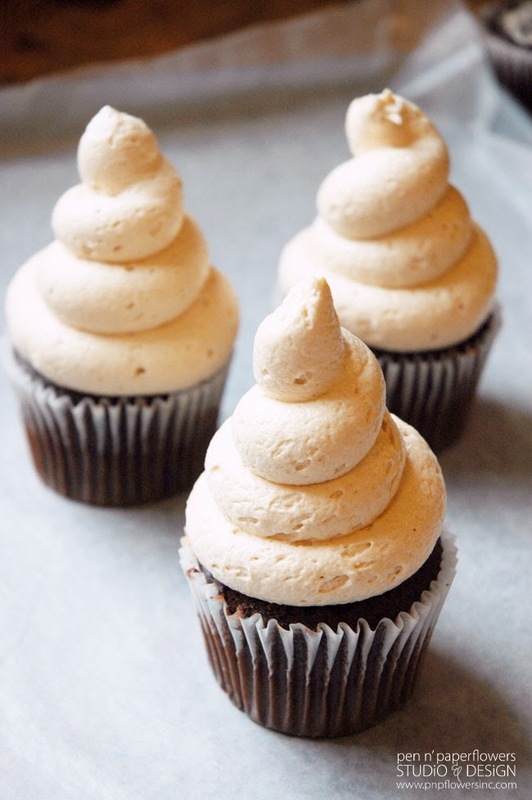 I then grabbed AND DOUBLED my favorite super easy Peanut Butter Frosting recipe (see the bottom of the post) filled a piping bag (or ziploc) and grabbed my oversized 9P frosting tip from The TomKat Studio and began piping it on! (If you don't see it in the shop, shoot them an email). Perfection!! I knew this frosting would be the perfect (thicker) consistency you need when making a Hi Hat Cupcake. 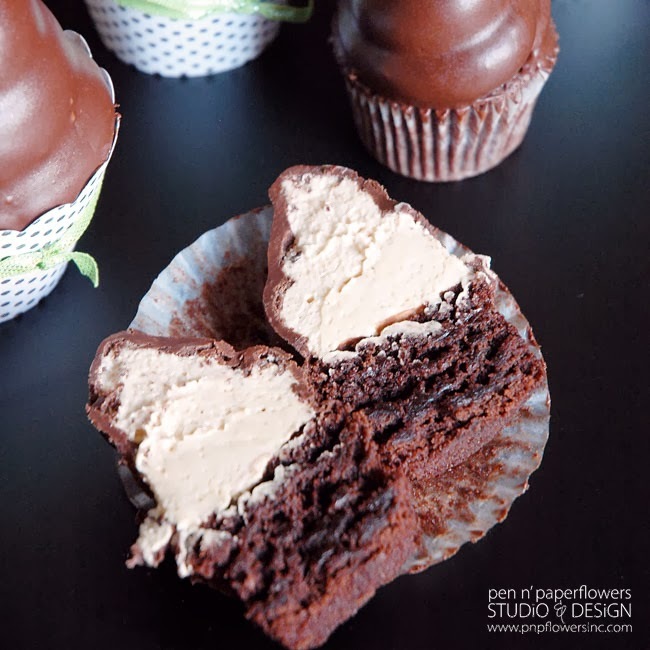 Don't be afraid to practice piping - either on the cupcake or on a piece of wax paper. 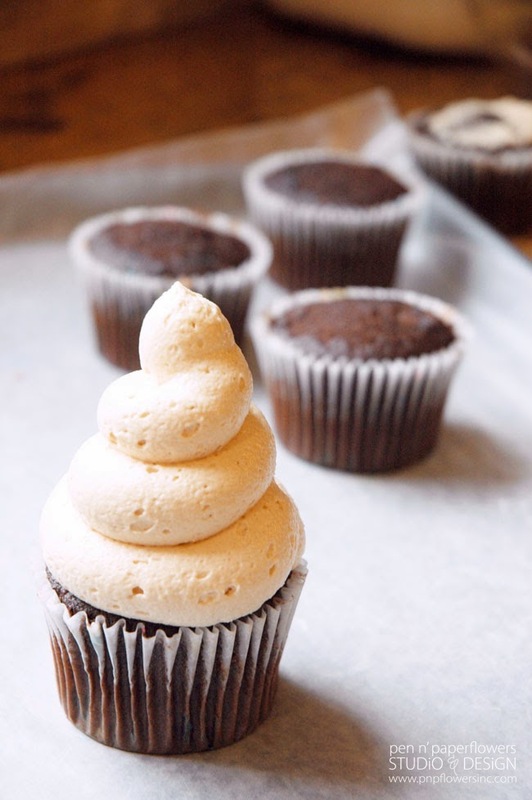 You can always scrape the frosting right back into your piping bag when you are done practicing. Side Note: It's been referenced that any 7 minute or 12 minute icing or thick frosting with a consistency for maintaining its shape will work for making Hi Hat Cupcakes. When the cupcakes are all frosted - place them on a cookie sheet and pop them into the freezer for about 20-30 minutes. If you are short on time...you can also choose to store the frosted cupcakes in an airtight container and refrigerate them overnight so they'll be perfectly ready for dipping the next day. Freezing your frosted cupcakes (or refrigerating overnight) is VITAL to the success of your hi hats. If your frosting is soft or room temperature you are guaranteed disappointment in your outcome. 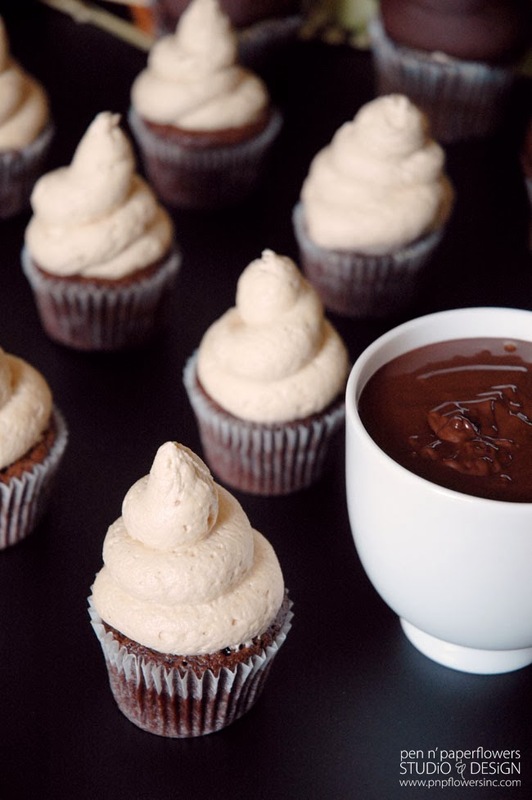 Aside from making sure your frosting consistency is nice and thick in order to achieve good height on your "Hi Hat" and then chilling your cupcakes - melting the chocolate is the next MOST IMPORTANT step. 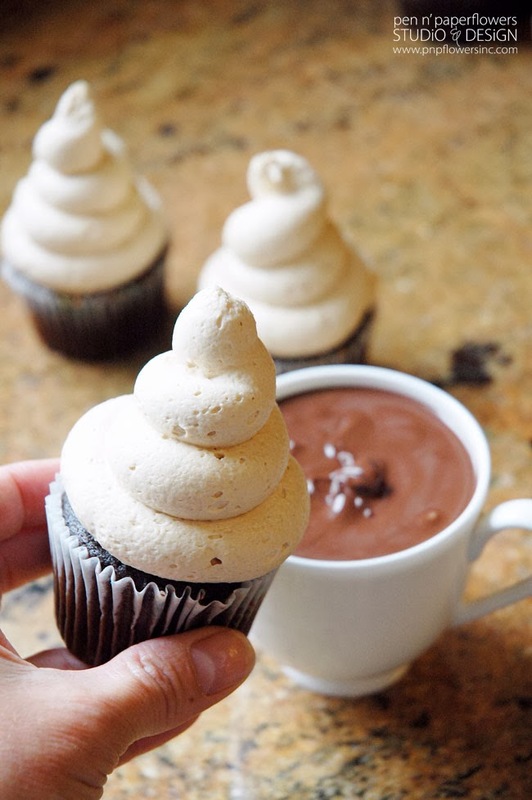 The chocolate can't be too hot - the frosting will melt. 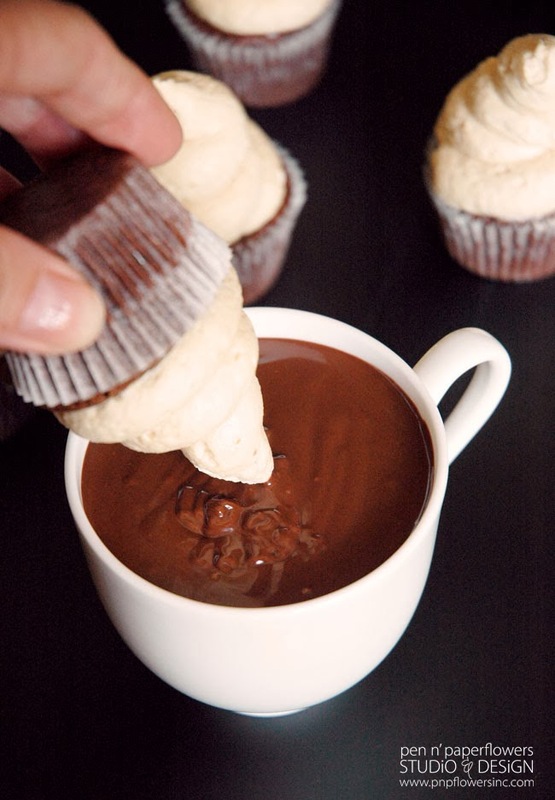 The chocolate can't be too cold - it'll be too thick for dipping. I'm happy to say was able to figure out a way to achieve the PERFECT chocolate temperature and without a candy thermometer or any waiting. (see the process at the bottom of the post). 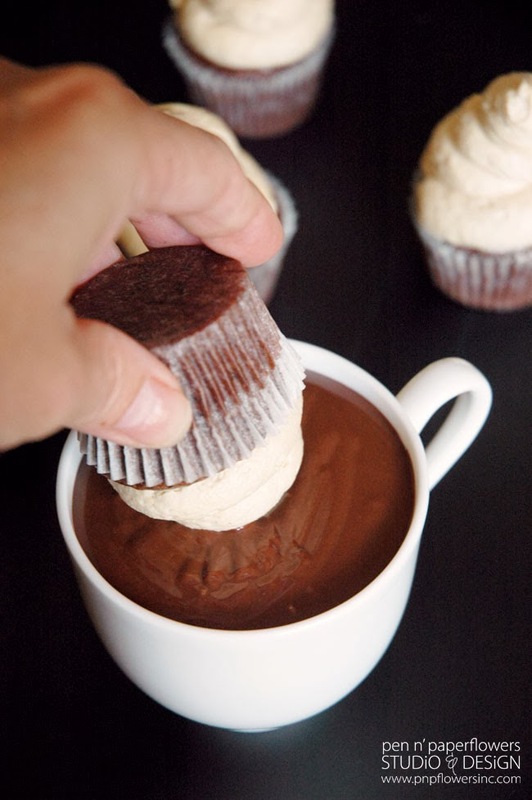 Slowly dip your cupcake frosting into the chocolate and if you want the edges to be completely covered be sure to tilt and roll your cupcake to do so. 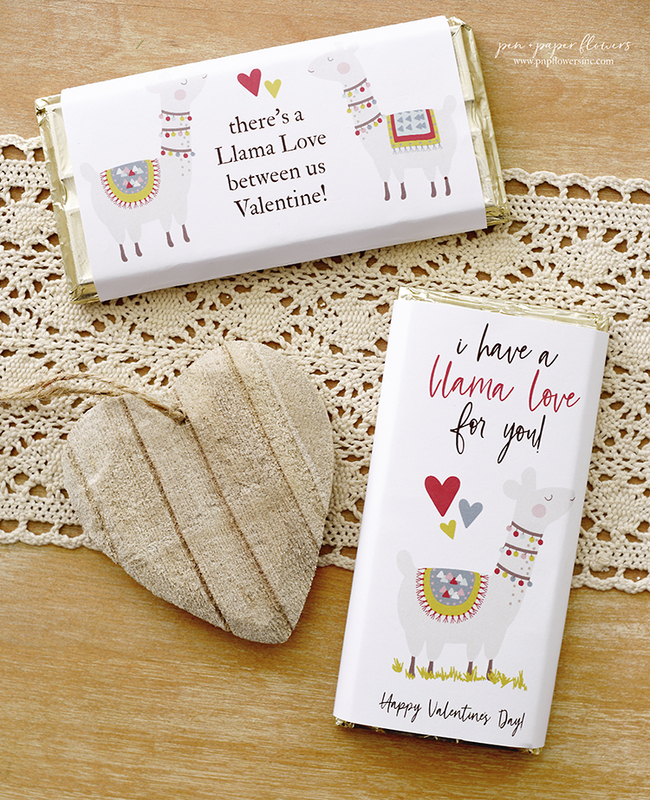 Touchups can be done with a wooden skewer or toothpick dipped in chocolate. 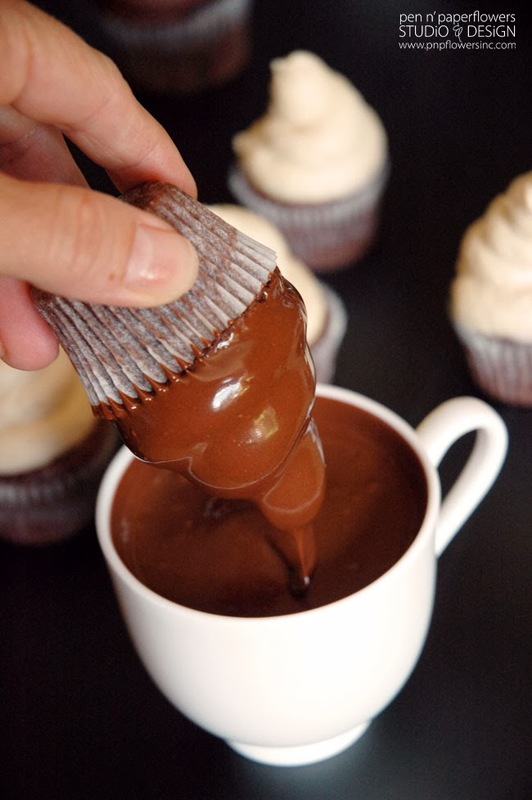 Allow the extra chocolate to drip off of the cupcake (and encourage this with small shaking movements). 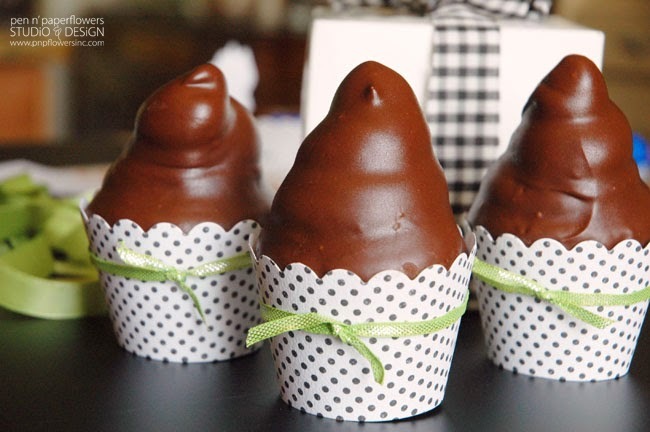 Allow the chocolate to set - put them in the refrigerator to speed up the process - and then wrap your Hi Hat cupcakes with a super cute cupcake wrapper - like these white and black polka dot wraps from The TomKat Studio. 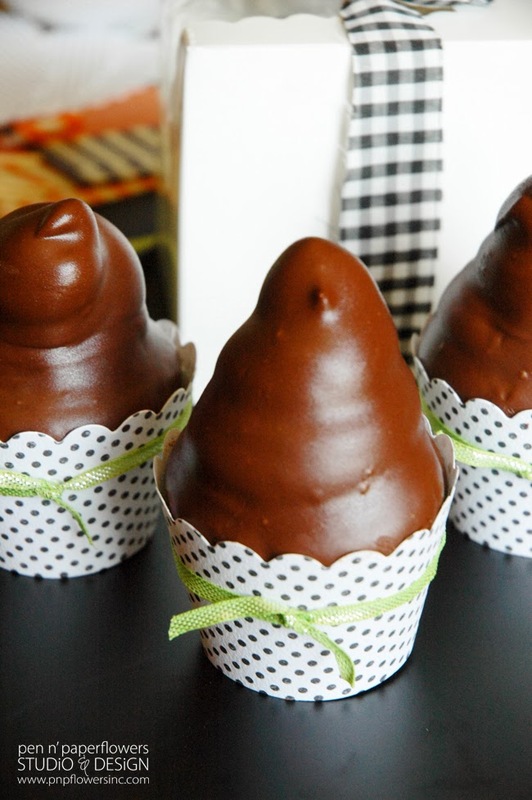 Tie on a cute ribbon as an accent and you are ready to wow your guests or the lucky recipients of these tasty treats! (I add a dab of hot glue under the knot of the ribbon on the front and secure the cupcake wrapper and ribbon with tape on the backside). Let's just mini size these! Besides, anytime I can find an excuse to mini-size something you know I'm going to take the opportunity to do so. See how shiny they are when they are first dipped? The large cupcakes in the background are already set so I love the comparison of the two finishes. 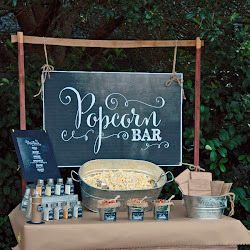 Be sure to PIN THIS idea for the future and come back and let me know if you try these out! Stay tuned for the Halloween version of these adorable and tasty Hi Hats...coming soon! Add more powdered sugar for achieving the perfect consistency for a Hi Hat - amount will be dependent on your altitude, temperature of your kitchen, etc. I ended up using an additional 1 cup of extra powdered sugar when I doubled the recipe. Combine cream cheese, butter and peanut butter in a bowl. Beat until creamy for about 3 minutes on medium speed. Add powdered sugar. Beat another 2 minutes until light and fluffy. Add more powdered sugar to achieve the desired consistency for piping. Boil 2-3 cups of water in a pan. I used the bottom part of my double boiler but any pan will do. While your water is boiling in the bottom pan add HALF of your chocolate and 3 TBSP. of canola oil to the top pan of your double boiler. (or just find a bowl that will rest on top of the bottom pan - without it touching the boiling water). Once your water has come to a rolling bubble, turn off heat and remove pan from the heat source. Place your top pan (or bowl) of chocolate and oil mixture on top of the boiling water pan. Stir and continue to stir until the chocolate has melted completely. 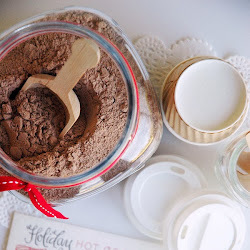 Adding the other half of the bag of chocolate to the already melted chocolate helps to bring the overall temperature down making it perfect for dipping and eliminating the need to have the chocolate rest for 2 or 3 minutes to cool down. Test it with your finger - make sure it feels like the right temperature to you. It should be warm. 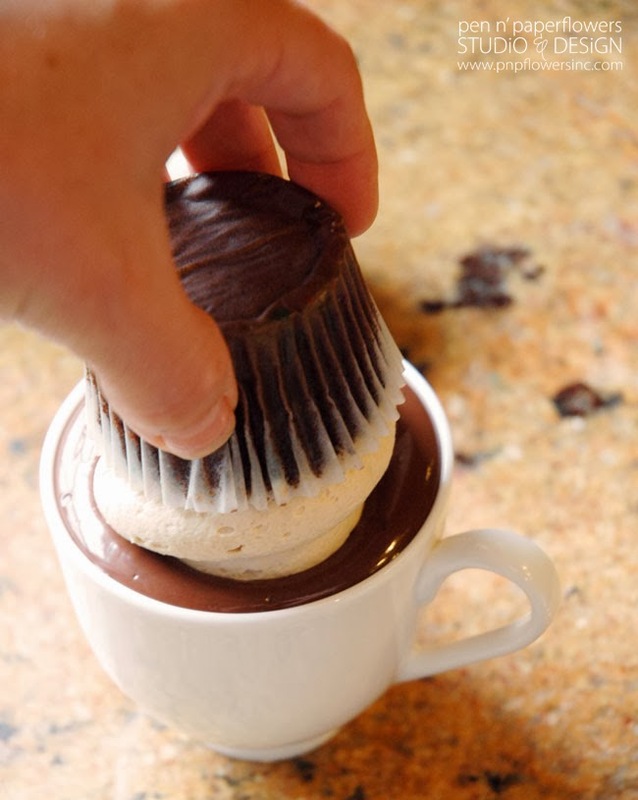 Transfer chocolate to cup that is both tall enough to allow your frosted cupcake to be coated without the tip touching the bottom of the cup as well as wide enough to fit your cupcake into. 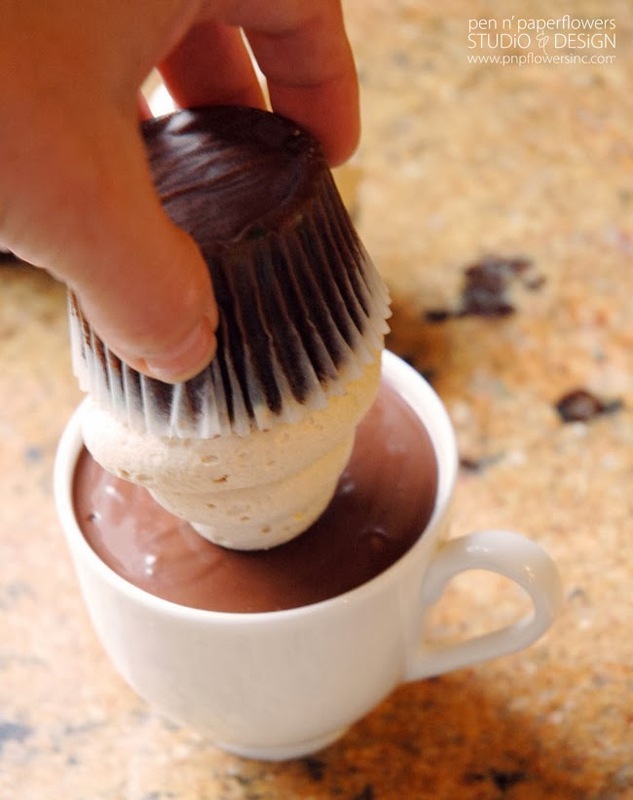 The bigger the cup you use, the more chocolate you will need to be able to fill the cup and keep the chocolate level deep enough for dipping. A teacup worked perfectly for me but I have seen people use a plastic kids cup or Bakerella used a leftover plastic easter cup. 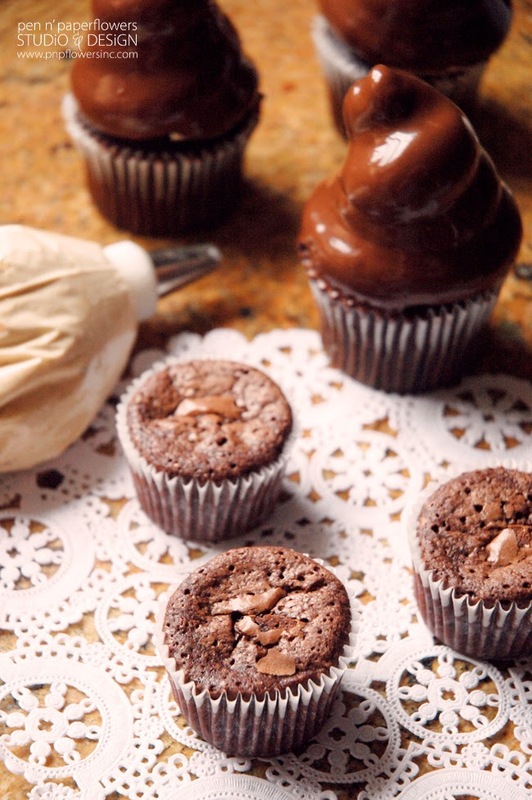 If you'd like a great chocolate cupcake recipe for making homemade cupcakes instead of doing store-bought , GO HERE! 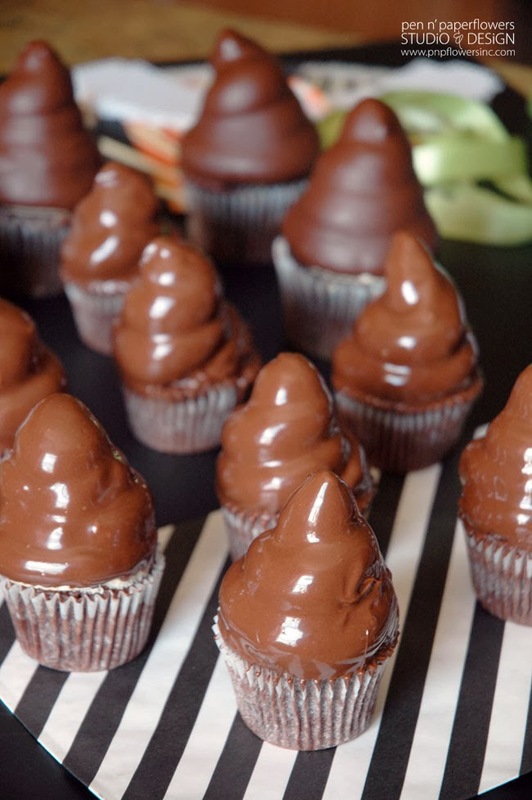 I turned these into Halloween Witch Hat Cupcakes by making cute Witch Shoes Cupcake Toppers and a cute DIY mini Halloween Witch Brooms. My first attempts at piping were NOT perfect! It's all in the wrist - as the saying goes! 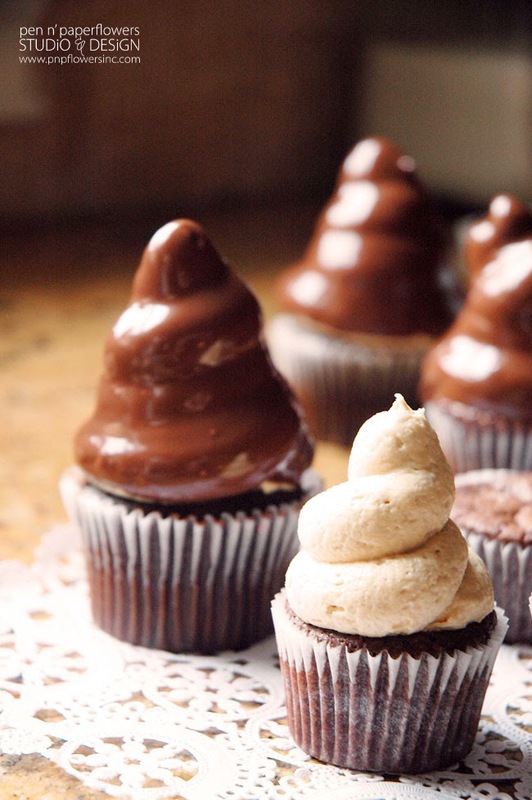 How did you even keep your chocolate cupcake's height right to the tip of the cups? It holds 3 TBSP. of batter which is the perfect amount for cupcakes.